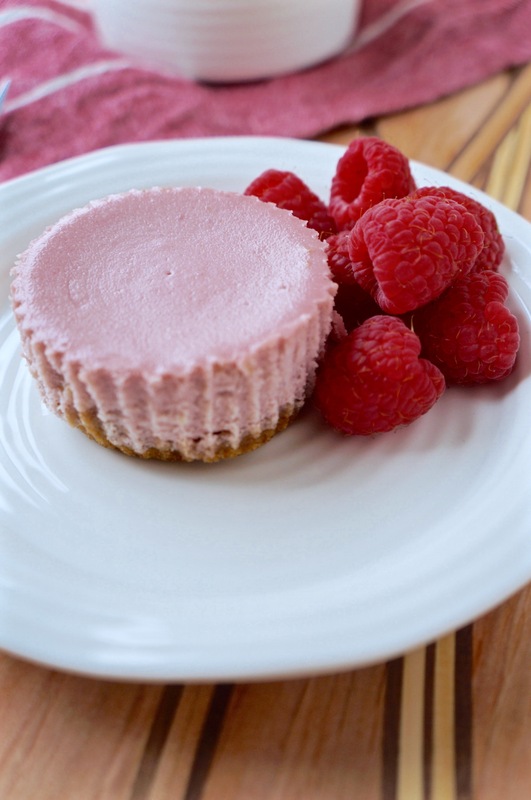 I used frozen raspberries in this recipe, because one; it’s winter, and two; it’s what I had on hand. Frozen berries are picked ripe and frozen right away, so often, they have a better flavour than buying fresh imported berries. I like to keep a stock of frozen berries in my freezer since they make a quick and easy breakfast when mixed with yogurt and homemade granola, or when added to muffins, pancakes, or smoothies. To make the raspberry purée, I cooked frozen raspberries with just a touch of sugar, puréed the mixture, then passed it through a fine mesh strainer to remove all the seeds. You can also make this recipe with blueberry or blackberry purée resulting in a lovely purple-coloured cheesecake. Preheat oven to 350°F. Line 24 muffin tins with paper liners. 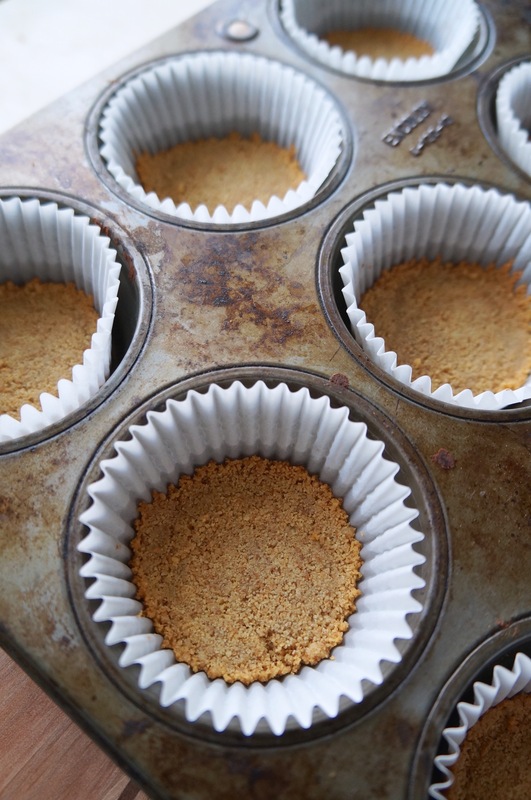 Combine graham crumbs and melted butter, divide evenly between all the paper liners (~2 tablespoons each). Using a small spoon press the graham cracker mixture down to form the base. Bake for 5-6 minutes, remove from oven and set aside to cool. Prepare the filling: in a stand mixer beat the cream cheese, flour, and sugar together until very smooth, about 3 minutes – scraping down the sides often to ensure everything is evenly mixed and there are no lumps. Add the raspberry purée, lemon zest, and vanilla. Mix until well blended. Add the eggs, one at a time, beating until just combined. You do not want to beat the mixture too much once the eggs are added, otherwise the cheesecake will rise too much and when it cools it may crack. Allow the cheesecake to cool for 10-15 minutes in the pan before removing. 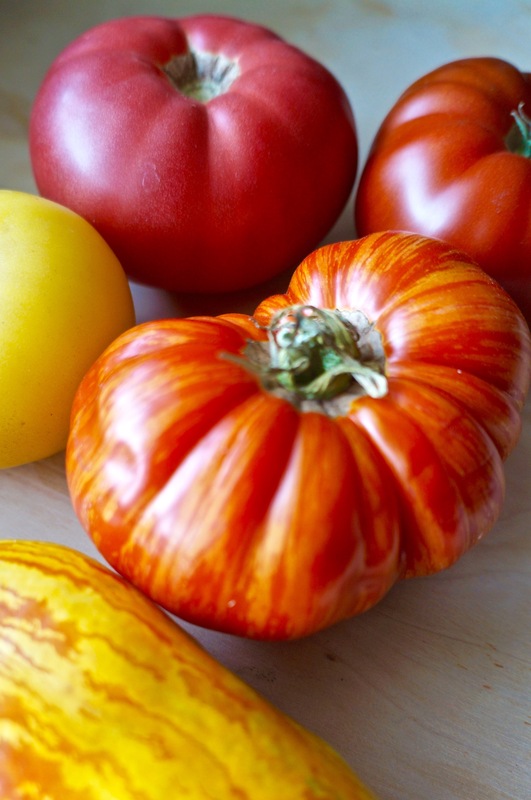 Keep in the fridge until ready to serve, or freeze for later. 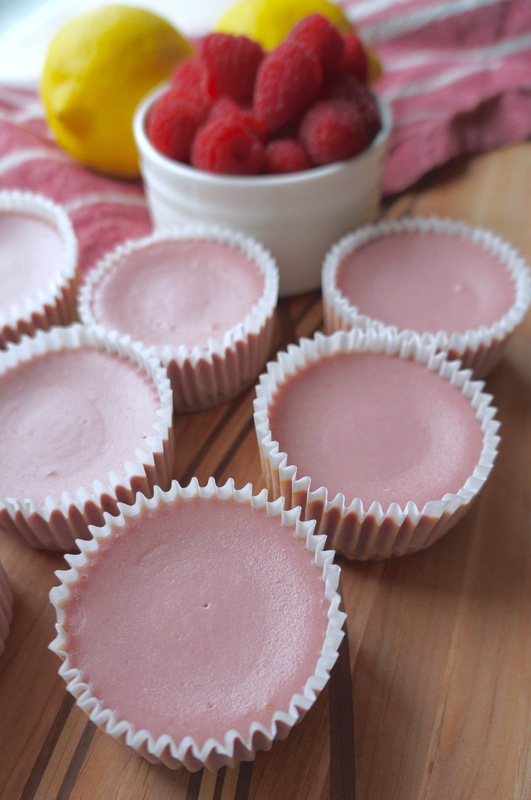 Serve with fresh berries or more raspberry purée. Combine frozen raspberries and sugar in a medium saucepan over medium heat and bring to a boil. Cook the berries and sugar for about 5 minutes, stirring occasionally until the berries are broken down and slightly thickened. Cool the mixture, then puree it in a blender. Using a fine mesh strainer and the back of a spoon, strain the sauce into a bowl to remove the seeds. Make sure that all that is left in the strainer is the seeds – it takes a little while to press all the puree through. Toppings: green onions, cilantro, grated cheese, avocado/guacamole, sour cream, diced fresh tomatoes, sliced jalapeños, hot sauce, tortilla chips, cornbread….let your imagination run wild! Adjust seasoning to taste and continue to cook until most of the liquid is absorbed, about 15 minutes. 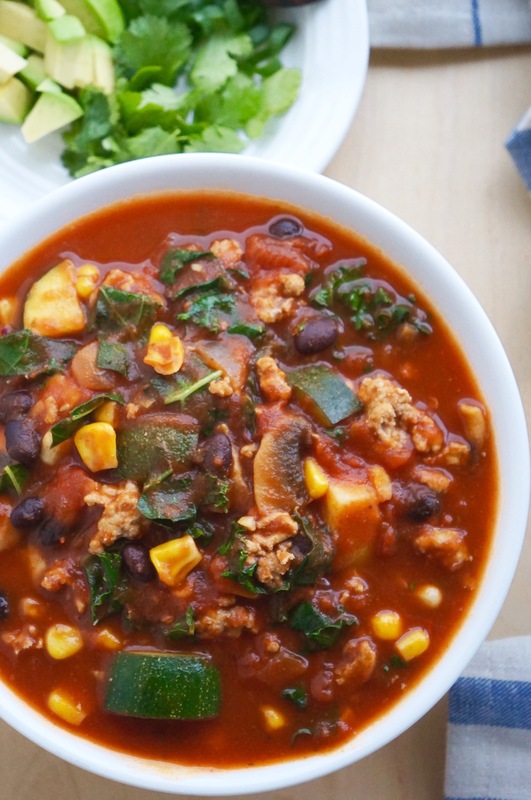 At this point you can cover the chili and turn heat to low and keep cooking for up to a few hours – the longer it cooks the more flavour you will develop. 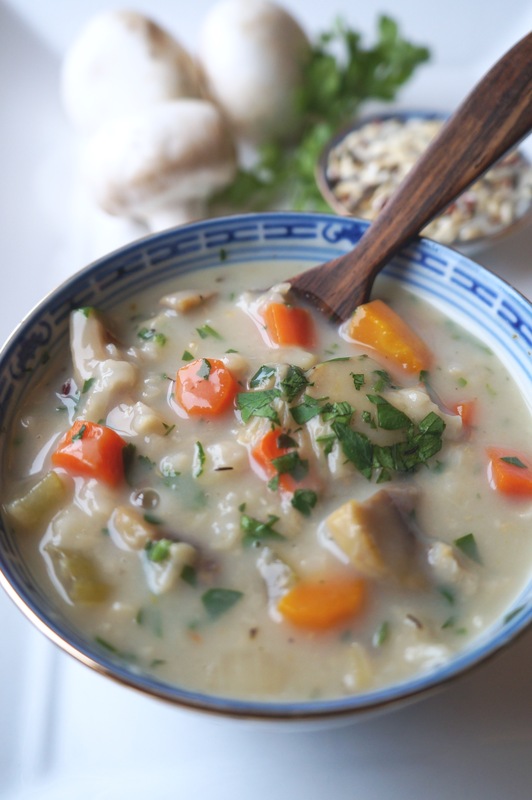 Cooking a big batch of soup or stew is one way to ensure you have healthy meals even if your busy schedule doesn’t allow time to cook each day. Boy am I glad that I have these leftovers in my fridge for lunch today. Going to keep this post short because I need to get back to watching my stories. 2 boneless, skinless chicken breasts, diced into small pieces. Heat oil in a large soup pot over medium high heat. Sauté onions, mushrooms for 5-6 minutes stirring frequently until mushrooms begin to caramelize. Add the carrots, celery, and garlic. Continue to cook for another 2-3 minutes. Add wild rice, dried thyme, and water/stock. Bring to a boil, cover, and cook for 30 minutes. Add diced chicken, milk, and parsley. Cook for 5-8 minutes or until chicken is cooked and the rice is tender. If the soup is too thick you can add more milk to desired consistency. 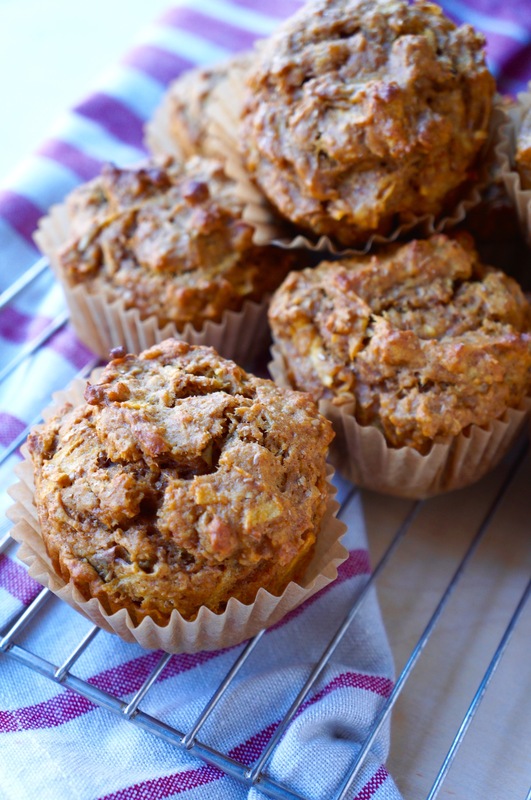 These muffins combine the irresistible flavours of pumpkin and cinnamon along with another of my Fall favourites, apples. I had a bag of Honeycrisp apples on hand so that’s what I used today when the baking urge struck me, but feel free to substitute your own favourite apple variety in this recipe. Grated apple helps to provide a touch of sweetness and moisture which keeps these muffins light and fluffy. When I’m cooking or baking with apples I prefer to keep the peel on the apple because one, I hate waste, and two, it provides additional fibre and texture. Plus, it saves time, who doesn’t love that? 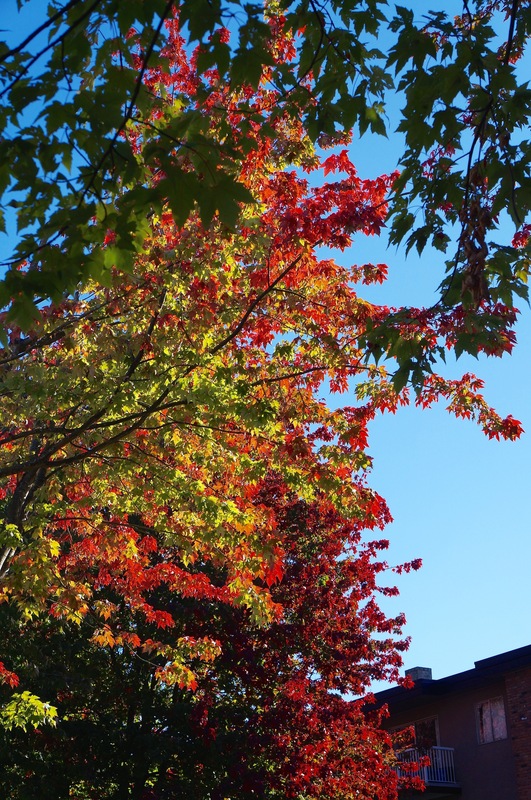 This photo was taken on a stroll around our neighbourhood this afternoon. I can’t get over how pretty this time of year is or how wonderful my kitchen smells after baking a batch of these muffins! Recipe by Kirsten, makes 12 muffins. optional add ins: 1/2 cup chopped walnuts/pecans or pumpkin seeds. 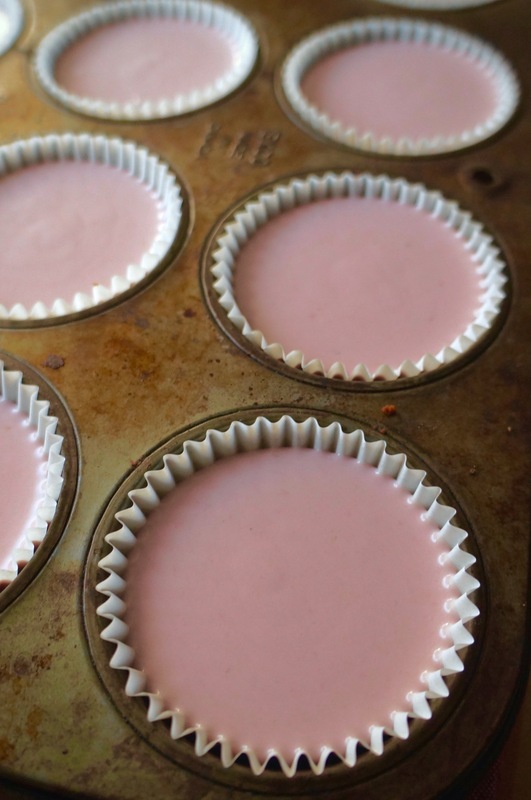 Preheat oven to 350F and line a 12-cup muffin pan with muffin liners. Combine dry ingredients in a large mixing bowl, set aside. Combine wet ingredients into a medium mixing bowl and stir until well combined. If using optional add ins you can mix them into the wet ingredients now. Make a well in the centre of the dry ingredients and then add the wet ingredients. Stir until just combined, it’s ok to have some streaks of flour. Bake for 22-25 minutes or until the tops are golden brown and the centre of the muffin springs back when lightly touched. Cool in the pan for 5 minutes then transfer to a wire cooling rack. When making blueberry pancakes I like to add the blueberries individually to each pancake once they are on the griddle. This way you get an even amount of blueberries in each pancake, and avoid those blue streaks that often result when you mix blueberries into a batter. This technique also works well with bananas, chocolate chips, or any other addition you want in your pancakes. Placing a cookie sheet in a preheated oven (~200F) will keep the cooked pancakes warm until the rest of the pancakes are ready. This is especially helpful if you are doubling the recipe and serving a large crowd. 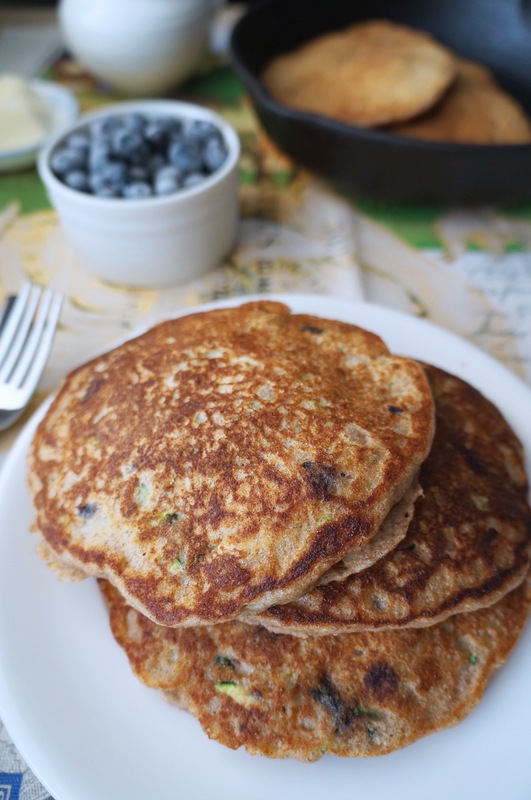 These pancakes retain their moisture and keep in the fridge for a few days, or you can freeze the pancakes and reheat in a toaster or toaster oven for a quick weekday breakfast option. It can be confusing when looking at different flours or breads, what’s the difference between whole wheat, whole grain, and multigrain? First off be wary of anything that says “multigrain”. Simply put, it means that more than one grain was used and often these grains are refined and have been stripped of their fibre and vitamins/minerals. Make sure to look at the ingredient list, you want to see the word “whole grain”. Whole grains are exactly as they sounds, the whole grain has been milled down to make flour, leaving all the nutrients intact. Nutrition lesson over, time to celebrate with some pancakes! Don’t have zucchini on hand? Grated apples make a great addition, simply replace the 2 cups of zucchini with 2 cups of grated apple. Yum. 2 cups of grated zucchini, ~1 large zucchini or 2 medium. In a separate medium-sized bowl beat the eggs, oil, buttermilk and vanilla. Then stir in the grated zucchini. Make a well in the dry ingredients and add the wet ingredients. Stir until just combined, lumps are ok! Ladle ~1/3 cup of batter per pancake onto a preheated skillet or cast iron pan, sprinkle blueberries on top, and allow the pancakes to cook until small bubbles are visible all over the surface of each pancake. Flip and continue to cook for another 2-3 minutes or until the centre of the pancake springs back to a light touch. 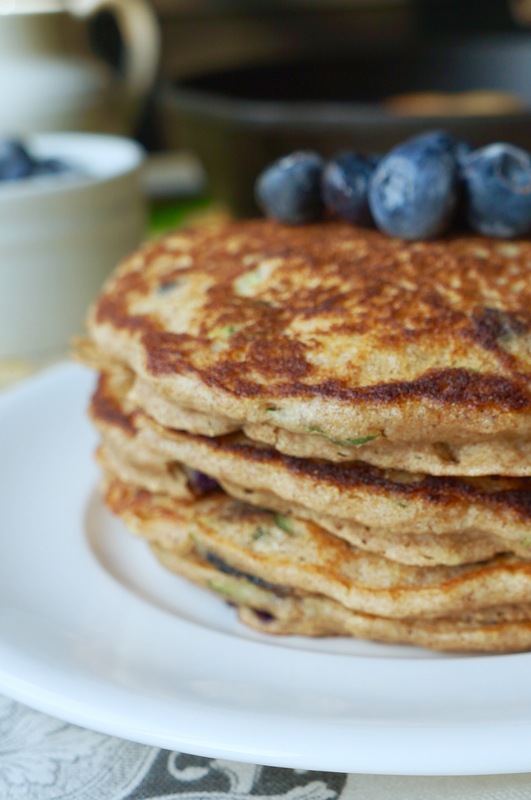 Serve with maple syrup, a dollop of greek yogurt, and fresh blueberries. *Tip: If you don’t have buttermilk simply add 1 tablespoon of lemon juice or vinegar for each cup of milk you need. One of my all time favourite salads is an Italian Caprese salad. Sometimes the simplest of foods can be the most delicious. I’ve taken the classic combination of fresh sliced tomatoes, basil, and bocconcini cheese (a type of small fresh mozzarella), and added juicy peaches and kale. 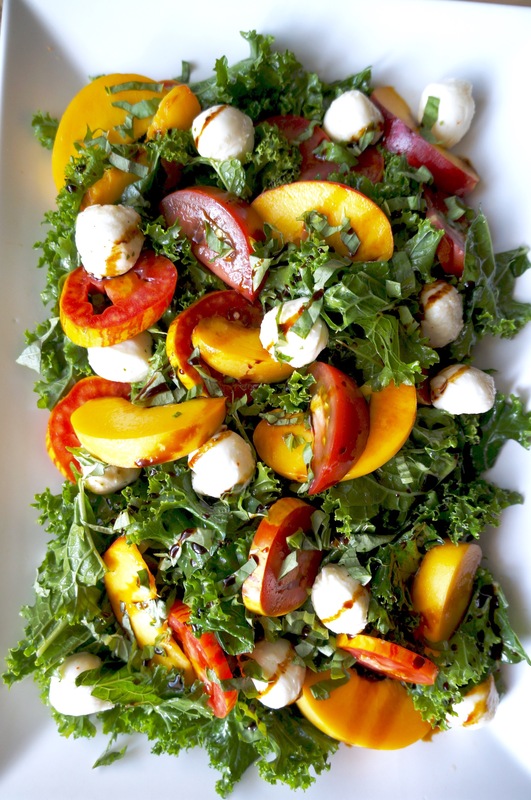 Don’t worry, this isn’t any old kale salad; take a look at these beautiful heirloom tomatoes and peaches. The kale is simply dressed in some lemon juice and oil, which when massaged into the kale helps to tenderize the otherwise tough leaves. 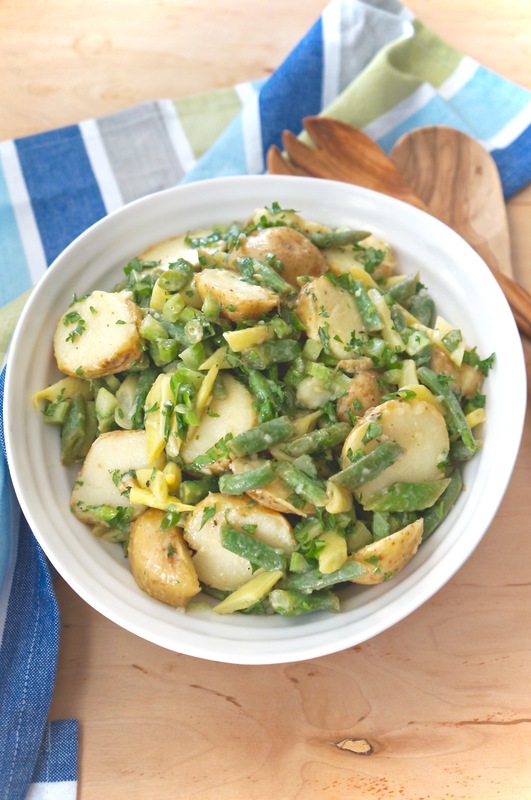 This salad makes a perfect side dish alongside grilled meat or it’s hearty enough to eat on its own for lunch or dinner. I’ve got the rest of those 20lbs of peaches to deal with and I’m thinking that my favourite peach pie would make a perfect dessert for this weekend. In a large salad bowl, combine chopped kale with lemon juice, oil, and a small amount of salt and pepper. Massage by hand until all the leaves are coated. Don’t worry about being gentle, the kale can handle it. 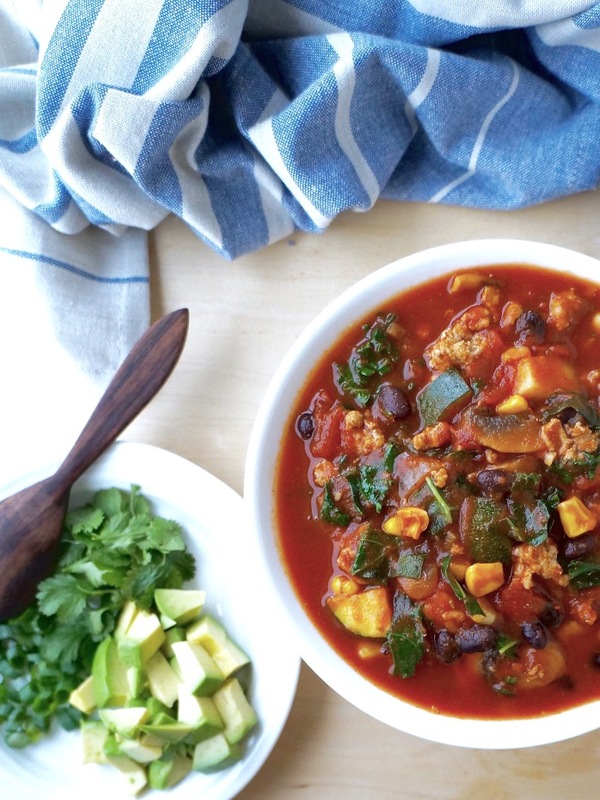 Set the kale aside and prepare the rest of the ingredients. 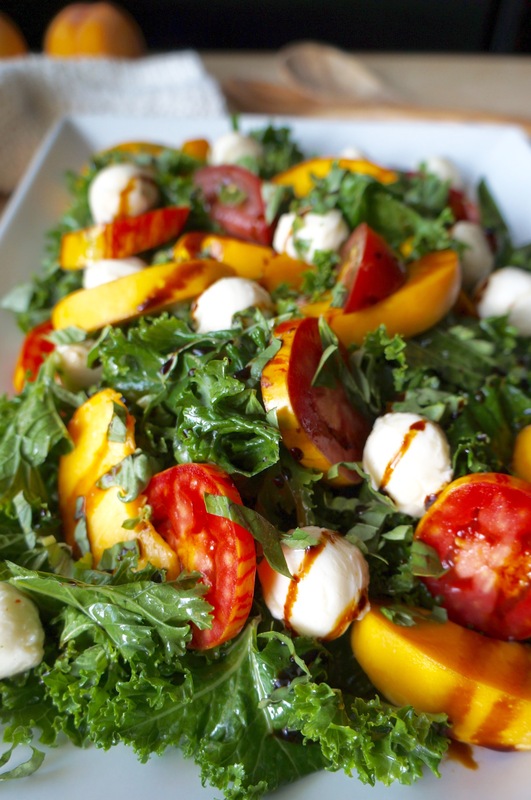 Before serving, top the kale with the peaches, tomatoes, bocconcini cheese, basil, and drizzle with balsamic vinegar. 1. Bring a large pot of water to a boil, cook the new potatoes whole, for 12-15 minutes, or until a fork pierced into the potato comes out easily. 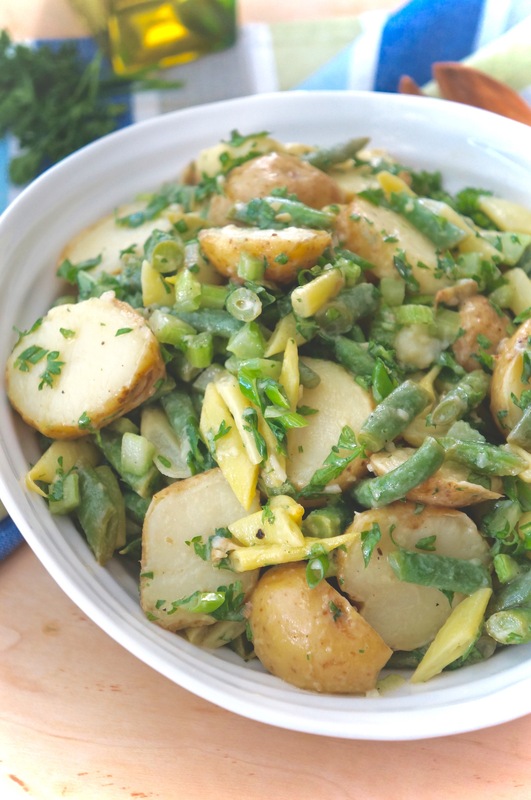 Remove the potatoes from the water with a slotted spoon, and set aside to cool slightly – reserve the water to blanche the green beans. 2. Bring the water back up to a boil, then add the sliced green beans and cook for 2-4 minutes. Prepare the ice bath by combining ice and a bit of water in a large bowl. Test one of the beans at 2 minutes to see if it’s cooked to your liking, if not, continue to cook in one minute intervals. As soon as they are cooked, drain the beans in a colander, then quickly submerge into the ice bath. Once the beans are cold, strain the beans and set aside to dry. 3. While the potatoes are cooling, prepare the vinaigrette by mixing the olive oil, lemon juice/vinegar, dijon, garlic, and salt and pepper. 4. When the potatoes are cooled enough to handle, slice into rounds and toss with the vinaigrette in a medium bowl. Add the green beans and refrigerate for at least 30-60 minutes. 5. Before serving, add the green onions, celery, basil, and parsley. Taste and adjust salt and pepper to taste.